really good info, I was not award they sold PVC sheets. I used the Rustoleum 2x rattle cans, worked good. For glue, I used the E6000. They used the green and white variety. Thought that sign said Noctural Emission for a second when I first glanced. Tripped and fell right in the gutter. I’m curious how it will hold up to UV light outdoors. That has always been a problem for me on outdoor signs, especially black as it tends to chalk up. I coated the whole thing with poly once it was done. I’s only been a few months, so not sure of the long term. This sounds like my kind of fishing trip! What material setting can be used for the high density foam? I’m using the free Easel version and it does not have a foam setting. MDF or ?? I’d imagine MDF is right. I always seem to manually override anyway. Ok, thanks! I’ll try that. Just ordered a 1" thick 4x8 sheet and 3/4 thick 4x8 sheet of HDU, both 15lb density. Wasn’t cheap by any means, but you get what you pay for and when you are putting a product out that potentially hundreds of people daily(at least in my case) will see, why wouldn’t you want the best product and your best work shown? 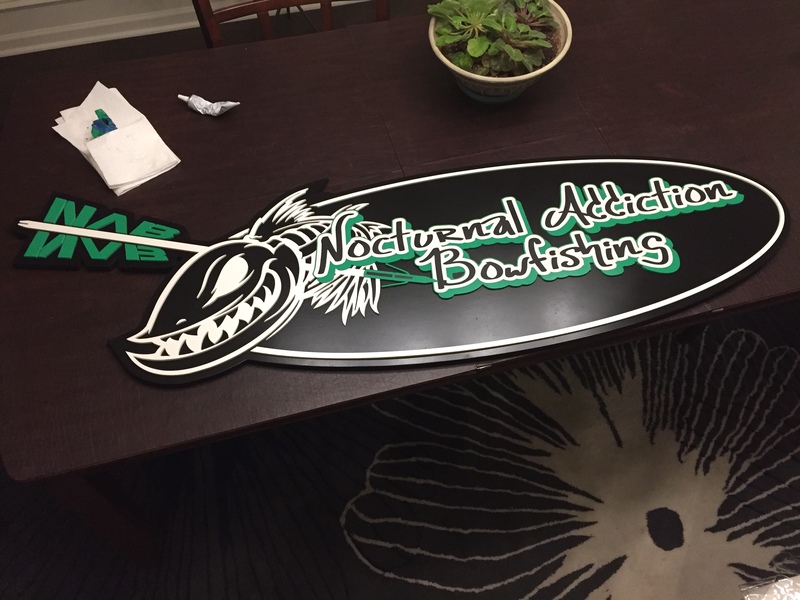 Its going to be an outdoor sign for a local business in a downtown area that is busy. I’ll have quite a bit left over for other orders, or FINALLY carving out my own logo to hang on the wall over my CNC. Luckily I found a supplier a little over an hour from me so I can go pick it up. You can call the people at Coastal Enterprises and they will give you info on any distributors near you like they did me. Super nice people. They will also send you free small sample to experiment with on painting and carving, and their website has a TON of information on working with it. I just went last night and got a 7.24 W board of this to mess around with. It’s got wood grain texture on one side and smooth on the other. Machines well and would have bought the 4x8 sheet but they were out. Precision board doesn’t have wood grain structure. You must have got PVC board or something along those lines. Do you happen to have a link to the HDU board that has a wood grain texture on one side? If you don’t have a link, a photo would be great, too. This would be perfect for an exterior sign project I’m doing, and I don’t have the software to properly create my own wood grain texture. Probably a PVC trim board. You can get them at the big box stores. Thanks for the reply, Neil; I think you’re correct. I just contacted Coastal Enterprises and they do not have any products with a pre-routed texture on on face. Looks like a trip to a big box store to look at PVC trim board is on the cards. @EmmettGallagher. You can find pvc trim boards at Home Depot and Lowe’s. It is in the moulding aisle. The largest I’ve seen is a 1x8 x10. Sorry for the delay but like everyone said, PVC trim board at big box store. I think it would work for certain applications.